Products Towel rail radiators "Zeta"
Elegant and simple design, a combination of innovation and tradition: this is ZETA , basic model of the new product range from ZENITH. ZETA: a stylish source of heat. 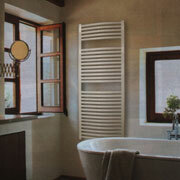 Conceived as towel rail, it is ideal for bathrooms but perfect in each setting because it suits all needs. ZENITH ZETA becomes expression of heat, pleasure and comfort. Warmth dresses with elegance to reflect a lifestyle, with taste and personality. Its technology and design answer to practical needs, its beauty decorates all settings. ZETA K: the choice of people who know that comfort living contributes the pleasure of life. ZETA is available in 9 heights (4 for version S and C, 5 for version K and KC) with different widths. Rounded edges, accurate welding, quality finishing and optimal heat output make of ZETA a radiator ideal to guarantee maximum safe in public places as schools, sport centres, etc.. Easy to install and to clean. Electric heaters are available on request for all ZETA towel rails.